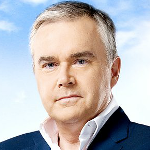 Huw Edwards is a newsreader, television presenter and the BBC’s go-to man for important breaking news. His calm demeanor and distinctive Welsh accent are ever-present as he covers major national and international news events for British viewers. Huw joined the BBC in 1984 as a news trainee, and remains with the corporation to this day, presenting BBC News at Ten, which is the most-viewed news programme on British television. He also occasionally presents on BBC News – the rolling-news channel – and BBC News at Six. Events covered by Huw include the Royal Wedding of Prince William and Kate Middleton, the inauguration of US President Barack Obama and the Queen’s Diamond Jubilee. Huw was also present as part of the commentary team at the opening and closing ceremonies of The Beijing and London Olympics. As a proud Welshman, Huw has been awarded BAFTA Cymru’s Best Onsceen Presenter award six times. He has also written two books – Capeli Llanelli: Our Rich Heritage and City Mission: the Story of London’s Welsh Chapels, a passion of Huw’s.